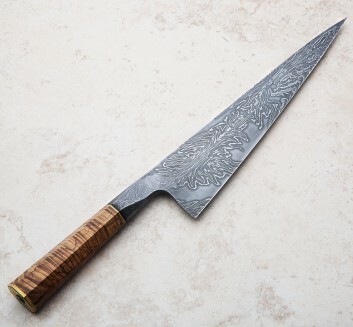 Having built his first forge around the age of 17, Saul Kokkinos Kennedy of SKK Knives has worked across metal-centric disciplines, focusing his talents on stunning and artful custom chef knives often forged from house-made damascus and san mai. The son of a goldsmith and lifelong student of metalworking, Saul points to the "combination of functionality, artistic design and science, plus (his) love of cooking" as the reason he was drawn to kitchen knives. 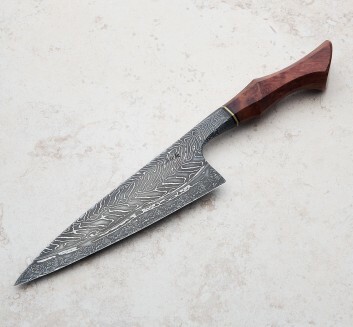 Saul's attention to the details is easy to see at every point along each knife, from the expertly formed integral bolsters to the brass and copper accents and elegant handles carved from picturesque cuts of wood. 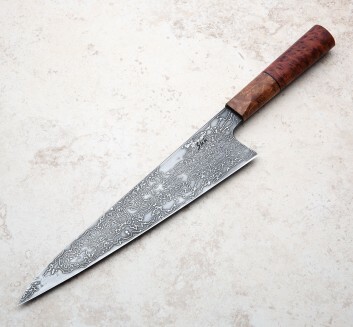 Built to be used daily, hardened and with balance and edge geometry to match the level of craftsmanship, each knife represents that marriage of form and function that we can't keep our eyes, or hands, off of.